Kernicterus is the word that rocked our world, BIG TIME. It’s the reason behind extended hospital stays and bili lights for newborns here in the US, and I really wish I had known what was at risk! IT IS IMPORTANT TO REMEMBER THAT KERNICTERUS CAN BE PREVENTED IF JAUNDICE IS PROPERLY TESTED AND TREATED. A SIMPLE BLOOD TEST OR USE OF A BILIMETER, SOME BILIRUBIN LIGHTS, OR A PROLONGED STAY IN THE HOSPITAL CAN SAVE A CHILD FROM A LIFETIME OF DISABILITY! This our son under triple bank photo therapy after his double exchange. His bilirubin level reached 45.6. Furthermore, it also important to note that there is no magically safe number when it comes to bilirubin levels. Gestational age, overall health of the newborn, and risk factors are key in determining when to intervene with phototherapy, and in some cases, blood transfusions. 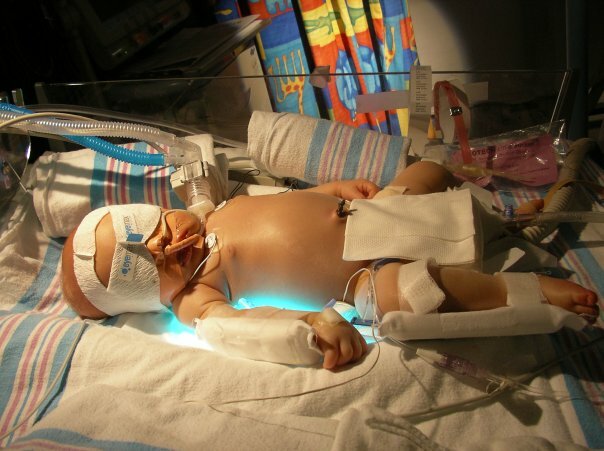 While lasting damage from jaundice is said to be rare, it isn’t as rare as you would think. We have new members coming into our support group across the US on a monthly basis, often several per month. While every baby’s story is different there is one thing in common, a casual attitude among practitioners about newborn jaundice. This is considered to be rare, in part, because it is 100% preventable…there is the blood test to determine exact bilirubin levels, photo-therapy to help little livers process and eliminate bilirubin and, in extreme cases, blood transfusions. It is also important to note that “visual inspection is never sufficient” according to the AAP, this is directed to health professionals that look at babies all day! Everyone told us that B was fine…doctors and nurses, lactation consultants (multiple times)…but they DIDN’T know…and we thought pink and red were good…but they were early indicators of jaundice. These professionals didn’t know that B’s bili was high, because they relied upon their eyes…the only way to really know is to do a blood test! Not all children affected by Kernicterus are affected as profoundly as B. I would guess that the majority have much milder symptoms, although still life-altering. You also may not be aware of all of the risk factors that a child has (as not all of them can be seen). Many risk factors are listed in the CDC’s literature. I highly recommed that you refer to it, if you have ANY quesitons about Newborn Jaundice or Kernicterus.This information could save a child from a lifetime of disability! If your baby ever had to be kept in the hospital or put under lights, it may have seemed to be a nuisance, but you really should be thankful! Dr. Bhutani of Stanford (a world-renown neonatologist) developed the Bhutani Nomogram, a graph that helps access a child’s risk of developing severe Hyperbilirubinemia (Jaundice). This is what Pediatricians, Neonatologists, and nurses refer to around the globe. Additional tools and info can be referred to here. It’s always a good idea to ask the physician caring for your newborn to show you where you’re child plots on the graph and discuss follow-up and treatment options, if appropriate. The American Academy of Pediatrics and JACHO (the national organization that regulates Hospitals) have each issued multiple alerts over the past few years, and yet new cases of Kernicterus are emerging every month. Please be a part of making sure that this catastrophic and 100% preventable tragedy is not allowed to keep happening. Spread the word! Support PICK! PICK’s parent support email group. Really helpful for affected families needing additional information. I have been looking for answers concerning my daughter for years. She had severe jaundice and didn’t get a blood transfusion. She is now 16 and struggles a lot in school, but more than that she is severely mentally ill. Do you think having high jaundice cause mental illness. Please respond on my facebook. Tonya Mack Miles. Thank you. Very sorry to hear of your daughter’s struggles. I don’t know how much could be related but I think it a good idea that you join our private parent group http://www.facebook.com/Kernicterus and discuss her behaviors and symptoms with other parents with a variety of levels of Kernicterus involvement. hi my daughter had a kernikterus and she is just 2weeks old,just want to ask when will we normally noticed the difficulty she will have? This group is a LIFELINE for our families! I’m so very sorry to hear that your daughter has been diagnosed too. Please join us over at http://www.facebook.com/groups/Kernicterus for discussion of treatment, life with Kernicterus and so much more! It’s been a lifesaver for me, as a parent of a child with kernicterus!